A Gift Guide for the Different Types of Personalities in Your Life — made & co.
We know Valentine's Day is right around the corner, and we think the gifts that scream “I love you!” are the gifts that are well thought-out with the other person in mind! Which is why we’ve categorized our jewelry into “personalities”. Know a mom, a volunteer, a teacher, or someone who is always helping others? Look below for our top pick for them! Have a perfectionist in your life that loves the idea of raw and natural stones but can’t seem to get past the fact that they’re all so different? We’ve got something for her, too! Or maybe you’ve got someone you’re shopping for who likes to change things up and keep her style interesting — she can be the hardest to buy for, but yes, we’ve even got something she’ll love! Rather than pairing stones that look similar enough for earrings, but are still two totally different stones, our Echo Earrings are our take on the traditional hoop earrings and are the same over and over again. Our Echoes are made by wrapping wire around the crystals that we unearth and then slipping the stone out to leave the shape of, or echo of, the stone on the wire. The Echo Earring is simple and classy easy to pair with anything! All the moms, volunteers, and teachers out there need something practical and efficient, because their lives revolve around helping and caring for others. Our Stud Earrings are the perfect gift! Their neutral color makes them easy to pair with everything; they sit snug on your ear so they won’t get pulled or tangled; and they are unique enough to add that touch of *special* to your outfit! For the trendsetters and role models who inspire others, our Dangle Earrings are your perfect match. These earrings are our best seller simply because of word of mouth. We wear these at shows, they sell out. Someone posts a picture wearing them, orders come in. These earrings are admired by all for their ability to be both minimalist and elegant! There are no two pieces alike in any of our jewelry, but the Cluster Necklaces are by far the most interesting, extraordinary pieces. With so much texture, so much variation, balanced by so much simplicity these pieces are as unique as the one wearing them! The Story Necklaces encapsulate everything about made. 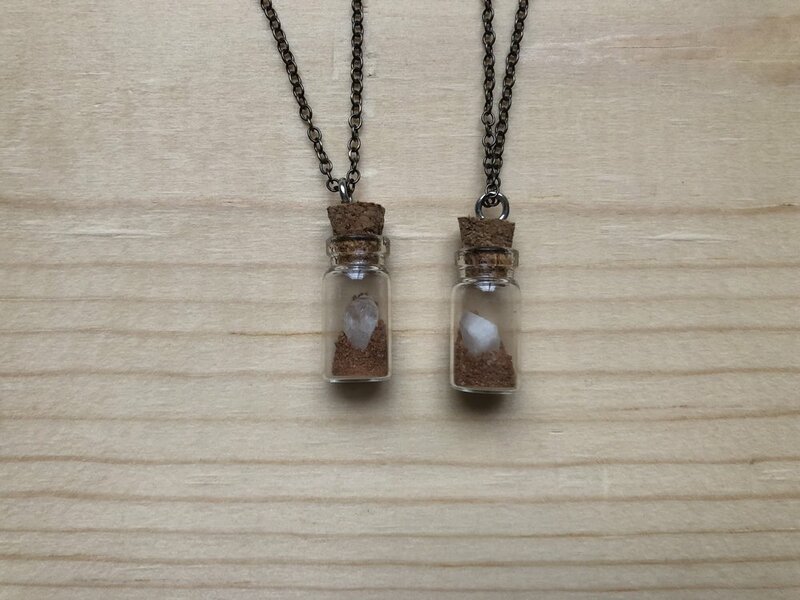 With clay from the mountains and fragments of quartz and crystal found from the footpaths, these necklaces give whoever wears it the opportunity to be reminded, and remind others, of how no matter where we come from or what our pasts look like, we are all beautiful and so worth the dig. Know someone who likes to show their creativity through their wardrobe? The Lariat Necklace is versatile just like this personality type! Because The Creative type is always changing things up they need something that can be paired with many different looks and the Lariat can be worn at least three different ways! Though at first glance this may seem like a simple necklace, our Signature Necklace is were it all began. This piece was the catalyst as Stacy challenged the market on what was considered "beautiful" and "desirable". With this piece she convinced others that imperfections had their own beauty and that what everyone else considered "desirable" was overrated. The Gardener Line, available in necklaces, bracelets (pictured), and earrings was created for those who love to get dirt under their nails just as much as the excuse to dress up. The combination of leather and chain creates a simple, yet dynamic, look that we think sums this gal up perfectly.